I genuinely love writing about food. It doesn’t matter how many people I reach, it’s just therapeutic to put down what I feel about food and to share recipes that have worked fantastically for me! Over the last few months, I have been at a crossroads – my small social media and digital marketing agency has taken off really well and that leaves me with very little time to blog! I’m hoping I can change this by installing a WordPress app on my phone to let me blog whenever I have a few minutes! This post is the first using this new app as I head to Bombay. Chips and dip are a classic combination! I think it takes a lot of will power for someone to turn down this combo! Perhaps it’s more attractive and comforting because it is enjoyed best when shared with friends and family. Whenever I think of chips and dip, I think of happy faces, casual seating and lots of laughter! It also reminds me of the time my mom came to visit me in Monterey, where I was studying. She had just come down from India and was rather jet lagged. At 4 AM, I hear a ‘crunch, crunch’ sound breaking the deafening silence of the town. I head to the kitchen to find my mom with a giant pack of chips and a tub of Artichoke-Cheese Dip, seemingly pleased and in a trance! It’s an incident that my brother and I often laugh about while my mom dishes out weak defences every time.. If I concentrate, I can still hear the crunching of the chips and her sheepish look that morning! 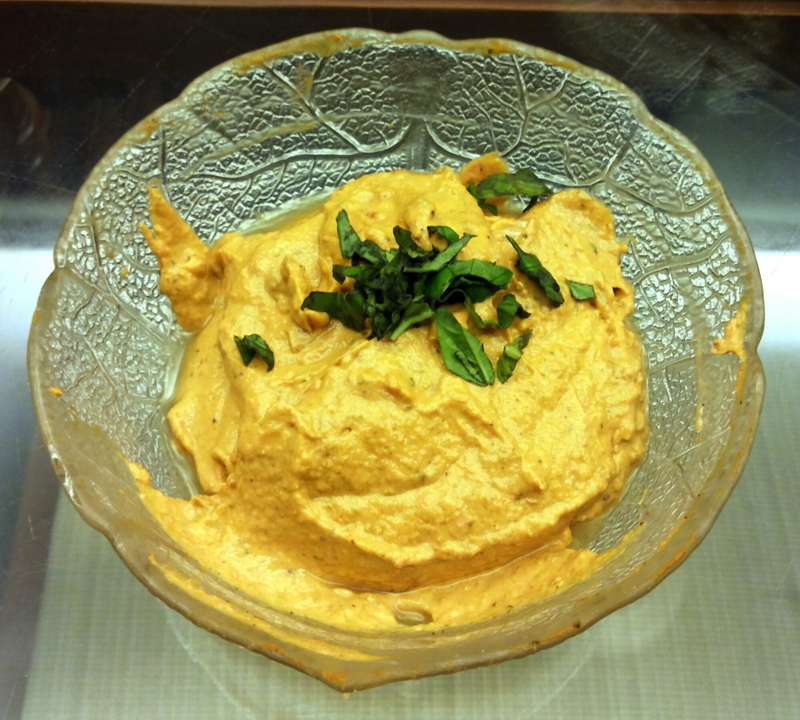 This Sundried Tomato-Basil Dip is fabulous!! It’s creamy, tangy and can be made spicy. Perfect for our Indian palates and goes really well with our packaged Salted Chips. I cut out all the mayo and sour cream from the original recipehttp://m.allrecipes.com/recipe/81396/sun-dried-tomato-dip/?page=0 and substituted it with some thick, hung curd. I did keep some of the cream cheese, but reduced the quantity to keep it lower in fat. 1. Rehydrate the sundried tomatoes by letting them soak in a bowl of hot water for 15 minutes. 2. Once the tomatoes have rehydrated, strain the water, keeping 3 TBSP reserved, and let them cool slightly. 3. Add the garlic, pepper, salt, tomatoes in the blender, with a little of the reserved water, and blend till smooth. 4. Then add the cream cheese, curd and Tobasco to the mix and blend again. 5. Finally, add the chopped basil and blend till smooth. Taste the dip for seasoning and adjust to your preference. 6. Remove the dip in a bowl and drizzle the olive oil over the surface. Keep in the refrigerator until ready to serve! Enjoy this dip with pita chips, potato chips or tortilla chips! I used completely dehydrated Sub Dried tomatoes rather than those preserved in oil to reduce the fat and calorie content. This dip cannot be stored for too long (2 days, at most) and must be refrigerated! What Have I Written so far?